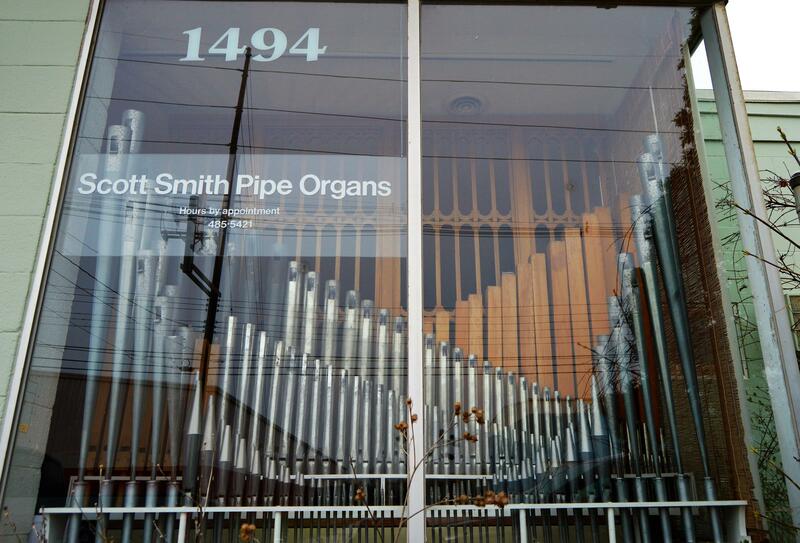 The shop window of Scott Smith Pipe Organs is filled with ranks of pipe. Hear some of the surprising sound effects and one of Scott Smith Organ Pipes' biggest projects in its debut performance. 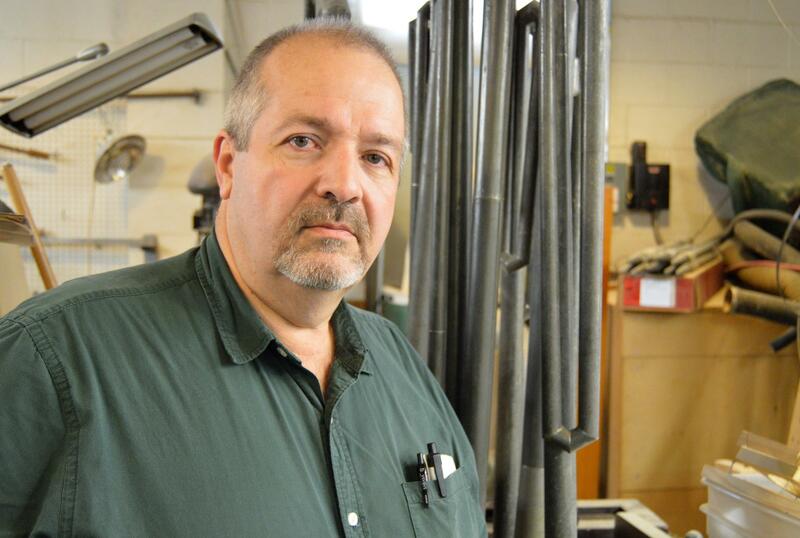 Scott Smith in his shop, some of the many organ pipes visible over his shoulder. “He thought I was kidding. And he argued with me and said, ‘No. Nobody does that anymore.’ So, I offered to let him come out to my truck and see how many pipes and wind chests that I had in there that I was transporting. And he said, ‘You’re not kidding,’ and I think that’s really kind of the attitude that many people have,” Smith said. 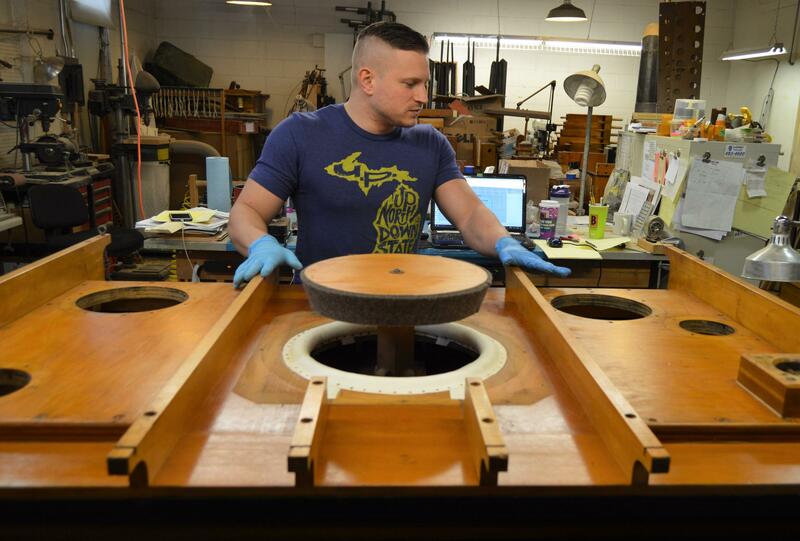 But, yeah, Scott Smith makes a living working on pipe organs. So does his co-worker Joe Granger. Granger went to school for architecture. “I saw the writing on the wall,” Granger said. It was 2003 and he said people in his class were lucky to get a job designing kitchens at Home Depot. Granger and Smith both play the organ. Granger used to drive past the shop on his way to rehearsals. Scott Smith’s shop is east to spot. It has ranks of organ pipes in the window. 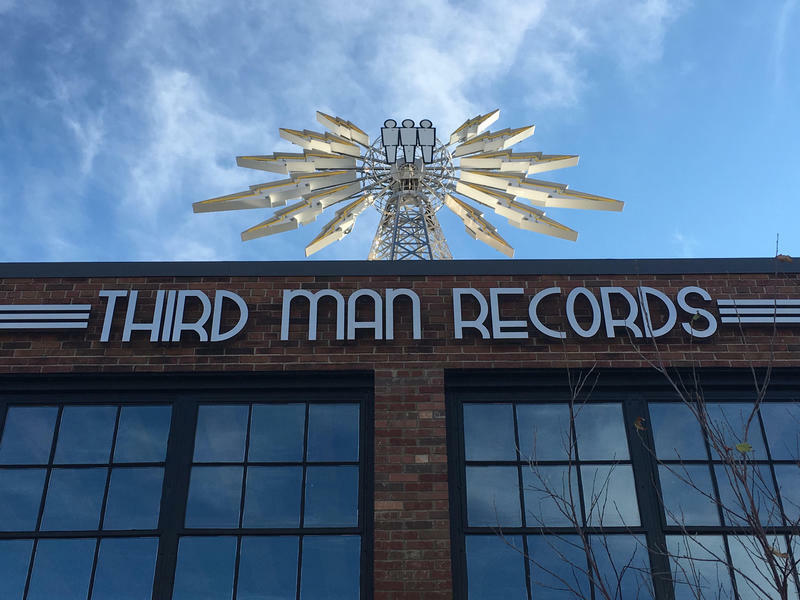 “And one day I just stopped in here and ten-and-a-half years later,” he said, smiling as he worked. He says it’s really rewarding, “to bring a dead organ back,” Granger said. 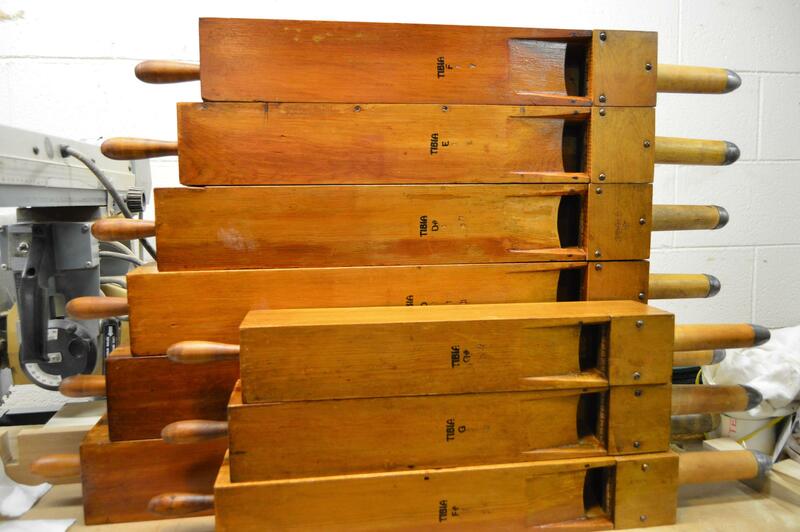 Joe Granger with the bellows (wind chest) for an organ at the Masonic Temple in Detroit. The shop is filled with parts being repaired or completely rebuilt. There’s a big wind chest, a sort of bellows, on the table. It’s part of the restoration of a organ at the Masonic Temple in Detroit. There are stacks of metal pipes and wood pipes, and all kinds of pieces and parts. Many of them around a century old. Because air makes everything work, much of the guts of older organs are dirty with coal dust and soot from playing for decades during the years of really polluted air in cities. I was poking around, learning about the uses of felt, and different leathers (kangaroo is the toughest and longest lasting) when I spotted something that made no sense to me. The trap chest had a wood block, a tambourine, castanets, a set of instruments to make the sound of horse hooves, and more. Each was triggered by a key or a pedal on the organ. 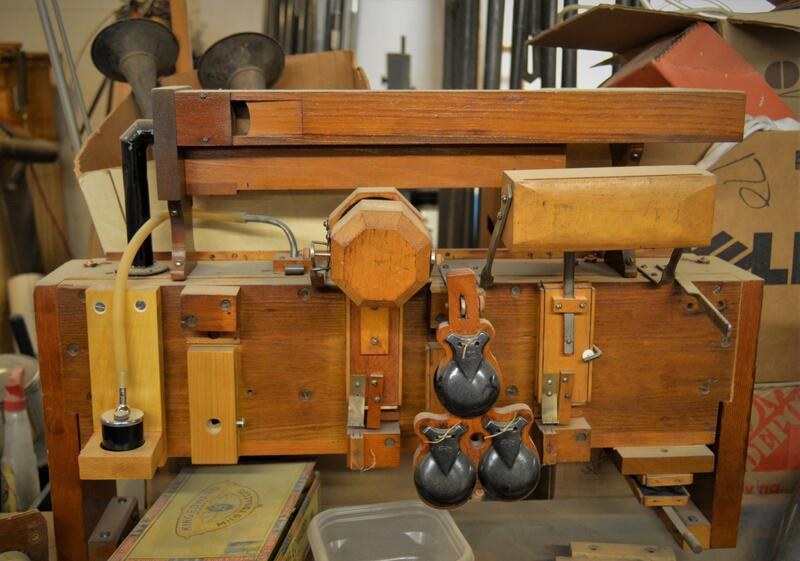 A "trap chest" used a wood block, castanets, tambourines, and other sound effects to complement silent movies. I did recognize the rectangular wood pipes on a shelf, they’d been pretty badly damaged at one point, but looked new now. They’re tuned with a stopper in one end of the pipe. You just push it down or pull it up a bit to tune the pipe. “These are made to move. I have used toilet wax in here (used to seal the bottom of a toilet with the drain pipe). We melted it down and the good thing about it is it acts as a sealant, but it also acts as a lubricant,” Smith explained. They’ve worked on organs all over the state and beyond. Pipe organs such as the one at the Fox Theater in Detroit, which is in need of a full restoration. But Smith says the magnum opus for his shop is the organ at the First Congregational Church in Saginaw. The stoppers (handles on the left) are used to tune the pipe. They can be moved in an out. Smith uses toilet wax to seal and lubricate the stoppers. “It was our job to bring it back and we did a tremendous amount of research,” Smith said. They visited six churches with Skinner organs measuring everything they could, listening to the organs, getting specifications to send to pipe builders. You can hear a little sample of what that organ sounds like in the audio above.